then the EOS 9-plate TURBO Water Ioniser is for you! At a great price & with excellent Ionza service backup. Made by EOS Hi-Tech, with 300 watts of power and 9 plates the Platinum can create the perfect water for any situation: alkaline with micro water-molecule-clusters, high in antioxidants and ionic mineral quality, - the best purified and ionised drinking water for you and your family. "I really like the EOS Turbo ionizers as they can offer me all the important alkaline settings: pH 8.5 - pH 9 - pH 9.5 - pH 10 and pH 11"
In addition it offers strong antioxidant potential with a strong presence of hydrogen and hydroxyl ions. Ionised alkaline water is frequently present in Health and Medical clinics. With ionised alkaline water on tap, fresh from the machine it will offer the family a wellness fountain. With so many different usages for drinking, cooking and even cleaning it offers many benefits. The powerful EOS Platinum can make up to pH 11 alkaline water and down to pH 3 acidic water. It offers 5 alkaline levels and 4 acidic levels. To reach pH 11 or pH 3 acidic, this is depending on the mineral content of the source water. The same applies to high ORP values. - ORP (Antioxidant) potential: -150mV to -800mV (depending on mineral content of source water). - Slotted Plates: The Platinum comes with patented slotted plate technology that utitlises all of the plate during ionisation, making sure edges aren't worn like with solid plates, drastically increasing the lifespan of the plate. The electrolytic plates cover a surface area of 220sq. inches, made from Platinum and Titanium for durability. The EOS Platinum performs great filtration power with industrial grade multi stage filters: premium acivated carbon filter as well as a specialized media filters to improve the purification of tap water and to remove many contaminants including chlorine, heavy metals, bacteria and many other contaminants. The Platinum continually monitors six internal operating systems ensuring product safety & optimal performance. Drains water from the electrolysis cell system and filter, to enhance full system cleaning and greatly expand the life-span of the Platinum system above and beyond other standard ionizer systems. Auto controls the pH and ORP of your water by adjusting the ionization according to the mineral content of your tap water. This allows the Platinum to estimate and display the pH and ORP of your water. The Platinum notifies you of each system function with voice prompts, with several volume levels, as well as mute. The sleek look and compact design of the Platinum can easily fit in with any decor in your kitchen or home. - Superior Materials: EOS Platinum systems utilise quality material, stainless steel adapters & non-toxic food-grade hose and plumbing. DISPLAY: The EOS Platinum tells you the filter life remaining for the number one and number two filters. It tells you the water flow in liters per minute. It displays the pH of the water as well as the ORP (by pressing the "set" button). If there is a problem with the Platinum, it displays an error code to tell you what's the problem. In the setup, it displays the 76 different ionization levels, the volume, the dozens of ORP levels, and so much more! The Platinum has 9 patented slotted plates inside a huge electrolysis chamber, designed for power, precision and performance. EOS is the only water ionizer manufacturer with an exclusive relationship with the Hee Sung Metal Company, the top rated metal company in Japan. Slotted plates have advantages over solid, flat plates. The water can flow more readily and can make more use of the plates available. This offers effective ionisation. When installed as an Undersink ionizer, then the ionizer is placed under the bench usually in a cupboard. 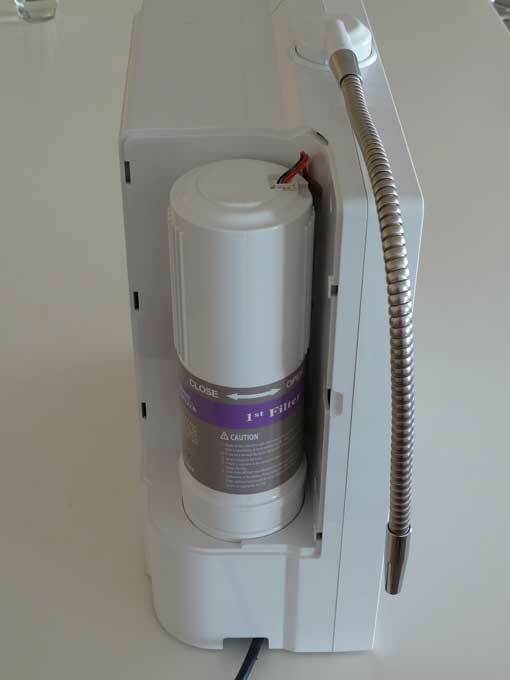 The outlet of the ionizer will be connected with a filter tap, which acts as a spout only. The water still needs to be turned on and off with the ionizer itself. Therefore the unit needs to sit prominent and easily reachable at the front of the cupboard and elevated. If you would prefer a more automated Undersink ionizer, Ionza offers several Undersink ionizer that can be controlled from the tap. Food and Drug Administration - United States. Registration for EOS Hi-Tech water ionizers. GMP is a system to ensure products are consistently produced and controlled according to quality standards. It is designed to minimize the risks involved in any pharmaceutical production that cannot be eliminated through testing the final product. A directive circular issued by the Ministry of Health in Jul 95 marked the official launch of GMP certification in China. The China Certification Committee for Drugs (CCCD) was established in the same year. A subsidiary organization was also set up to manage the certification program.Currently nine government agencies are the key agencies responsible for regulation. They are the State Food and Pharmaceutical Administration (SFDA), the State Development and Reform Committee, the Commerce Ministry, the State Traditional Chinese Medicine Administration, the Ministry of Labor and Social Security, the Ministry of Health, the State Population and Family Planning Committee, the Ministry of Science and Technology, and the State Quality and Technology Supervision Administration.In addition, more than 10 industrial associations also regulate the industry. TÜVs (German pronunciation: [?t?f]) (short for Technischer Überwachungs-Verein, Technical Inspection Association in English) are German organizations that work to validate the safety of products of all kinds to protect humans and the environment against hazards. As independent consultants, they examine plants, motor vehicles, energy installations, devices and products (e.g consumer goods) which require monitoring. The many subsidiaries of the TÜVs can also act as project developers for energy and traffic concepts, as problem solvers in environmental protection, and as certification bodies. Many of the TÜV organizations also provide certification for various international standards, such as ISO9001:2008 (quality management system) and ISO/TS16949 (automotive quality management system). The Federal Communications Commission (FCC) is an independent agency of the United States government, created, directed, and empowered by Congressional statute (see 47 U.S.C. § 151 and 47 U.S.C. § 154), and with the majority of its commissioners appointed by the current President. The FCC works towards six goals in the areas of broadband, competition, the spectrum, the media, public safety and homeland security, and modernizing the FCC. The CE marking (also known as CE mark) is a mandatory conformity mark on many products placed on the single market in the European Economic Area (EEA). The CE marking certifies that a product has met EU consumer safety, health or environmental requirements. Australia New Zealand electrical safety approval. The ISO 14000 is a standard for environmental management systems that is applicable to any business, regardless of size, location or income. The aim of the standard is to reduce the environmental footprint of a business and to decrease the pollution and waste a business produces. The most recent version of ISO 14001 was released in 2004 by the International Organization for Standardization (ISO) which has representation from committees all over the world. The ISO 14000 environmental management standards exist to help organizations minimize how their operations negatively affect the environment. In structure it is similar to ISO 9000 quality management and both can be implemented side by side. In order for an organization to be awarded an ISO 14001 certificate they must be externally audited by an audit body that has been accredited by an accreditation body. In the UK, this is UKAS. Certification auditors need to be accredited by the International Registrar of Certification Auditors. The certification body has to be accredited by the Registrar Accreditation Board in the USA, or the National Accreditation Board in Ireland. * ISO 14040 series (14040 to 14049), Life Cycle Assessment, LCA, discusses pre-production planning and environment goal setting. * ISO 14050 terms and definitions. * ISO 14062 discusses making improvements to environmental impact goals. * ISO 19011 which specifies one audit protocol for both 14000 and 9000 series standards together. This replaces ISO 14011 meta-evaluation—how to tell if your intended regulatory tools worked. 19011 is now the only recommended way to determine this. ISO 19001 specifies requirements for information supplied by the manufacturer with reagents used in staining in biology. It applies to producers, suppliers and vendors of dyes, stains, chromogenic reagents and other reagents used for staining in biology. The requirements for information supplied by the manufacturer specified in ISO 19001are a prerequisite for achieving comparable and reproducible results in all fields of staining in biology. International (Canadian Standards Association), a member of the CSA Group, is a provider of product testing and certification services for electrical, mechanical, plumbing, gas and a variety of other products. Recognized in the U.S., Canada and around the world, CSA’s marks appear on billions of products worldwide. CSA International certification marks indicate that a product, process or service has been tested to a Canadian or U.S. standard and it meets the requirements of an applicable CSA standard or another recognized document used as a basis for certification. For consumers, CSA International certification marks are intended to provide increased assurance of quality and safety. For manufacturers, international recognition of the mark may help to ease their entry into North American markets. CSA International certification marks are accepted by many North American regulators and by a large number of North American retailers. Billions of products bearing CSA International certification marks are found on the shelves of well-known retail chains and sold by major product distributors. CSA International tests products for the North American and International markets against applicable standards including those of the Canadian Standards Association (CSA), Underwriters Laboratories (UL), NSF National Sanitation Foundation (NSF), American National Standards Institute (ANSI) and other agencies. LOHAS is an acronym for Lifestyles of Health and Sustainability, health and fitness, the environment, personal development, sustainable living, and social justice. 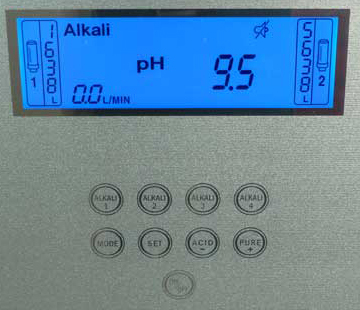 Click the button below to add the EOS Platinum - Turbo 9 plate Water ionizer /alkaliser to your wish list.